If you take away the historical impact of it, In the Heat of the Night is a classic crime film. But when you add the racial aspects, well it becomes one of the all time greats. When an important white gentleman is found dead, Deputy Ben Bubba (Warren Oates) is told, by Chief Gilispe (Rod Stiger) to check the usual spots: the pool hall and the train station. While the pool hall is indeed closed and empty, his trip to the train depot results in the discovery of a black man with a considerable amount of cash on him. Certain he has his man; Bubba takes him in to see the chief. 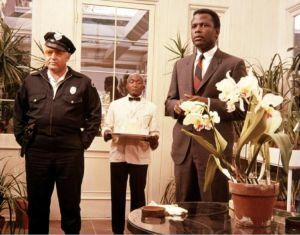 The man is Virgil Tibbs (Sidney Poitier) who, it turns out, is a homicide detective from Philadelphia. After a fairly tense questioning, this info comes out and Tibbs is released, but not before Tibb’s boss offers Tibb’s skills as a detective to help with the case. By the end of the film, Gillespie and Tibbs come to respect each other and have maybe…just maybe..even learn from one another. Now before I break down this edition, let me save some of you a little time. If you don’t own ITHOTN, you really need to pick it up. It truly is one of the greats. It was nominated for seven Oscars and picked up five. Know what? It deserved every damn one of them. Both Poitier and Steiger deliver the goods. Poitier shows great range here, expressing anger to compassion without going overboard. His performance, while not necessarily understated, is loaded with subtly. Steiger certainly comes across as your basic ignorant redneck sheriff, but clearly is just smart enough to know when is in over his head. This is not the first DVD release of IthofN (I am not sure what words get capitalized so bear with me.) so folks that already own it might be wondering if it is worth the double dip. The picture quality of the film itself is noticeably better than in the previous release, the images are sharper and the colors much stronger. First up is a commentary track with director Norman Jewison, cinematographer Haskell Wexler, and cast members Lee Grant and Rod Steiger. Sadly, Poitier is nowhere to be found here. The track provides some interesting insight, treating us to some technical aspects as well as giving some historical perspective. It is pretty clear that not all of it was taped at the same time, but spliced together to sound like a conversation. This track is the sole carryover from the previous DVD release. For this anniversary edition, MGM saw fit to put together a trio of new featurettes. Turning Up The Heat: Making movies in the 60s. This is a look at the making of the film and the impact it had on cinema at the time. Filmmaker John Singleton as well as various historians as they share their thoughts on Heat and reactions it garnered both in the white and black communities in the 60s. For those of us that did not live through the 60s, this is extremely enlightening as it talks about civil rights and the issues of the time. The Slap heard round the world. This, running eight minutes, talks about the impact of a very memorable scene between Tibbs and Eric Endicott (played by Larry Gates). We hear from many of the same interviewees (from the previous featurettes) as they discuss this. The scene may very well have been the first one to show a black man slap a white man. This scene shows Tibbs refusing to allow himself to be treated as less than the man he is. I saw this film, for the first time, when I was about 12. Even at that time, I understood the power of the scene, but not the historical importance. This will certainly help some folks see what this meant for many of those that were struggling for their civil rights and liberties. Even if you have purchased the previous disc, this is a must own. The picture quality alone makes it a worthy upgrade, with the extras being a bonus. Order In the Heat of the Night from Amazon. The original books were written by John Ball who went to high school right behind where I live here in Milwaukee.